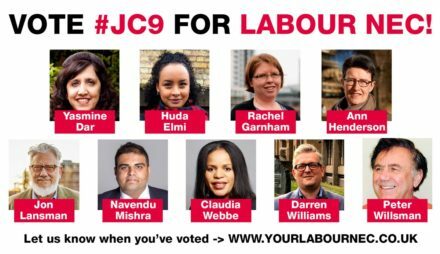 The full Corbynite slate – termed the #JC9 – has been elected to represent local parties on Labour’s ruling body. Ann Henderson, Claudia Webbe, Darren Williams, Huda Elmi, Jon Lansman, Nav Mishra, Pete Willsman, Rachel Garnham and Yasmine Dar will take their places as CLP representatives on Labour’s national executive committee (NEC) from October 2018 after party conference. The results constitute a significant victory for the Corbynite left of the party – particularly as the successful candidates include Peter Willsman, whose Momentum endorsement was dropped after a leaked recording revealed he angrily doubted the existence of antisemitism within Labour at an NEC meeting. Willsman was ultimately endorsed by the Campaign for Labour Party Democracy (CLPD) and the Centre-Left Grassroots Alliance (CLGA), which are considered by some Corbynite activists to be to the left of Momentum. After the scandal over the recording published by the Jewish Chronicle and without Momentum’s backing, activists on the Corbynite soft left as well as the Corbynsceptic wing of the party hoped Ann Black would take up the ninth NEC place. But Black, who was supported only by small soft left group Open Labour, received just 45,566 votes, coming behind three Corbynsceptics – independent candidate Eddie Izzard and Progress/Labour First-backed Johanna Baxter and Gurinder Singh Josan.